In the last decade of the 20th century, Dojran has attracted the attention of the public by the problem with the dying out of Lake Dojran. There have been ever less tourists during the season. The visitors – only passers of the border with neighbouring Greece – have rushed to some other destination. Fishing with cormorants, characteristic of the fishing tradition of this small lake, is dying out as well. The inhabitants – worried... Above the area at the shore of Star Dojran, dominate the contours of the half-ruined cathedral dedicated to St. Elijah. Life comes from the Fountain of Life. 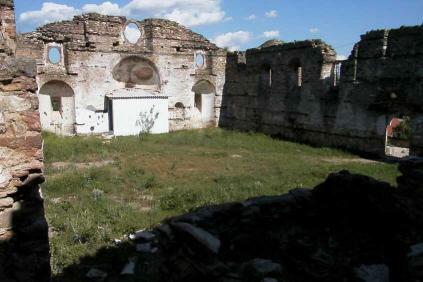 The renewal began with the first hierarchs' liturgy of Metropolitan Nahum of Strumica, under the open sky, on 2 August 2000, in the half-ruined cathedral of St. Elijah, which at present is being revitalised. Once, in the immediate surrounding of this largest church in Macedonia there was situated the residence of the first Macedonian episcope of Poljana since 1767 onwards – Parthenius of Zographou. In the morning on October 28, 1859, in the patriarchal church in Constantinople the consecration of the archimandrite Parthenius as episcope of the Poljana diocese was performed. Until then a monk of the Zographou monastery on the Holy Mountain and a teacher of the Russian royal family, a highly educated omniscient in theology, he was consecrated by Metropolitan Neophytus of Thessalonica. From that moment on, a new page has been opened in the history of the Holy Church in this diocese. For the first time the local Macedonian population in Dojran (Greek: Plains-man, Lowlands-man) and wider, attends divine services in its own mother tongue. Through the reorganisation of the ecclesiastical administration and the school network on the territory of Poljana diocese and in general in Macedonia, the newly appointed episcope Parthenius of Zographou (of Poljana) unreservedly puts himself into ministry to his for centuries oppressed and suffering people, in the struggle to introduce the church-Slavic language in divine services and the Macedonian vernacular in schools. He helps the poor, supports widows and orphans. Widely respected and loved by his spiritual children and the devout people. "...with evangelic humility and patience and with apostolic firmness and consistency, with care and zeal he worked for the well-being of his people... And, what is very important, Father Parthenius, as a spiritual shepherd made efforts his whole flock to be of one body and soul ." The revivalist activity of episcope Parthenius was kept an eye on with much attention and emphatic obscurantism by representatives of the Constantinople Patriarchate. Thus, when episcope Parthenius became the "soul" of the entire Poljana diocese, there were attacks and threats launched against him. Metropolitan Neophytus of Thessalonica, in the summer of 1861, summoned the Synod at which in a document – an impeachment with 22 items, episcope Parthenius was accused completely without foundation of an anti-patriarchal activity. Still, fearing the Russian diplomacy, and with the intention to meet the request of the Russian ambassador Lobanoff, the Patriarchate was forced to send a commission to the Poljana diocese in order to investigate "the Parthenius' case". After the executed investigation, the three-man patriarchal commission concluded that episcope Parthenius was not guilty, but on the contrary, that he performed his duty conscientiously. Nevertheless, H.E. Parthenius was not allowed to return to his diocese right away, in which, especially in Dojran, where his episcopal residence was, his spiritual children had awaited him anxiously. In September, in 1867, in order to please metropolitan Neophytus in his intention to appoint the disreputable Meletius an episcope of Poljana and to remove Parthenius completely from his diocese, the Holy Synod of the Constantinople Patriarchate offered the latter the position of a metropolitan in the Nišava diocese. Still, temptations did not go round him at his new duty either, since he interceded whole-heartedly for the Macedonian question. At the newly created circumstances and due to his poor health, on 17 October 1874, H.E. Parthenius was forced to resign himself the post of metropolitan of the Nišava diocese and to leave for Constantinople . At deathbed, he said to his closest associates, "The end of the suffering of our people draws near. Be alert and valiant. God is great and will set everything right. Jesus Christ, our Saviour, also had to pass through Golgotha for the Resurrection to come. So will also our people see its freedom and blessedness after so many afflictions and hardships it has endured and still continues to endure." The night between February 19 and 20, 1876, on the feast of St. Parthenius of Lampsacus, he departed in Constantinople, where until today his tomb is found in the yard of the Slavic Orthodox church of St. Stephen. Metropolitan Parthenius of Zographou will be remembered as a Macedonian Hagiorite monk from the Zographou monastery, one of the most educated Macedonians in the 19th century and one of the greatest erudites on the Balkans in general at that time, the first Macedonian episcope consecrated by the Patriarchate, a revivalist, an activist in introduction of the church-Slavic language into church services, a writer and publisher of schoolbooks, a teacher who introduced the Macedonian vernacular in schools, a preacher and a spiritual guide. His work is prolific and important both from cultural and spiritual aspects, because he contributed to the ecclesiastical-spiritual and educative-cultural self-awareness of the Macedonian people as a distinct Slavonic nucleus. In the beginning of 2001 from the Veljusa monastery, here, in Star Dojran, the first two nuns came. Near the former (today not existing) episcopal residence of Parthenius of Zographou, now there is a complex consecrated in his memory. The superior of the sisterhood is sister Febronia. The sisterhood is small. The monastery typikon is one of a closed character. It means that visitors can visit the newly built church dedicated to the Russian new-martyrs – the royal family Romanoff (a generation before them, the teacher of the royal family had been Parthenius of Zographou), whereas the residential quarters and the small church dedicated to St. Maximus the Confessor and to St. Gregory Palamas are part of the closed, monastic area. In this way, in a tourist place such as Star Dojran is, in the middle of weekend houses and noisy visitors, the nuns succeed in keeping monastic peace, necessary for life in a hesychasterion as this one is. In future, this complex is to include also the residential quarters of a future male monastery within the reconstructed church of St. Elijah . Icon painting and knitting prayer ropes, as well as making small and unique monastic handicraft is the main task between the hours for prayerful stillness and the divine services. With the renewal of the eucharistic life in the monastery complex of Saint Parthenius of Zographou in Star Dojran, the water in the lake and the life in the town returned.